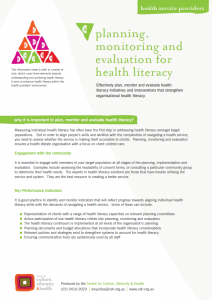 Why it is important to plan, monitor and evaluate health literacy? Measuring individual health literacy has often been the first step in addressing health literacy amongst target populations. But in order to align people’s skills and abilities with the complexities of navigating a health service, you need to assess whether the service is making itself accessible to clients. Planning, monitoring and evaluation ensures a health literate organisation with a focus on client centred care. It is essential to engage with members of your target population at all stages of the planning, implementation and evaluation. Examples include assessing the readability of consent forms, or consulting a particular community group to determine their health needs. The experts in health literacy solutions are those that have trouble utilising the service and system. They are the best resource in creating a better service. The planning, monitoring and evaluation cycle is an important process for identifying where the gaps and problems in health services are. The identification of these gaps helps us to create targeted interventions, or improve processes and systems in vulnerable areas. They can also identify problems and gaps in actual health literacy assessment tools. For example, most current assessment tools do not measure verbal communication, writing, advocacy skills, or the changes in health literacy for clients in times of stress.